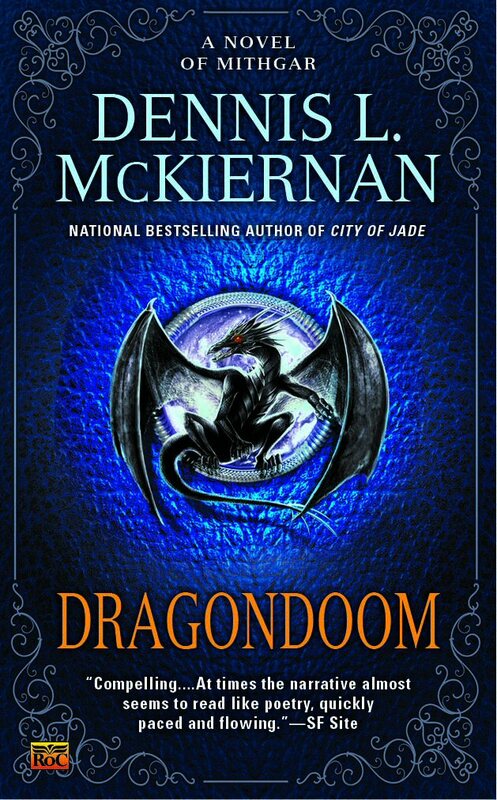 Dragondoom was a rather difficult story for me to structure. Oh, I knew the story I wanted to tell, but in the beginning I didn't quite know how I could tell it such that the reader would know that it was really Elyn's story--hers and Thork's. You see, if I told it in a linear fashion, I was afraid that the reader would get focused on the wrong person as being the protagonist in the tale. I was bothered. . . . Very bothered. . . .
With me still struggling with the structure, my wife and I took a motorcycle trip, riding from Ohio (where we lived at the time) to Colorado and beyond. It was while we were cruising through the Rockies that of a sudden I realized how to tell this tale. I've got it! I shouted through the intercom, as I pulled onto the shoulder of the twisting mountain road. Her ears ringing, her heart pounding (with that whoop, she thought doom was about to strike), my wife asked, Got what? The solution as to how to tell the story. From the rear luggage case Martha Lee retrieved the notebook I always carry, and I wrote a note to me telling me that I simply had to drag a chapter out from the middle of the book and shove it up front (it became chapter two). That done, we took off once more. About a hundred yards later, I pulled over to the shoulder again (I didn't shout this time). I wrote myself another note. Another hundred yards, another note. I must have written twenty notes to myself over the next mile or so. Martha Lee popped on and off the bike like Jill-in-the-box, she fetching my notebook while I kept the bike from rolling backwards down the mountainside. But at the end of that mile I had the interleaving structure that would let me tell the tale such that there would be no doubt just whose story this was. —Write it that way, I mean. 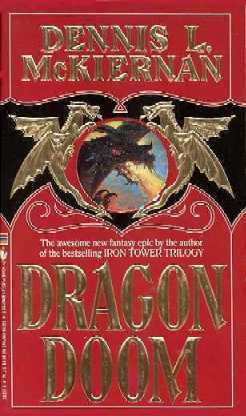 I finished it in September, 1988, one of the years of the Dragon. It became the favorite of many people. But then it went out of print, and stayed so for some time; subsequently, in ever-growing numbers, by snailmail and email and by phone and face-to-face, people would ask, "Where can I get a copy of Dragondoom . Used bookstores, book-finding services, huckster tables at SF conventions, web searches, on-line auctions, public libraries if someone hasn't stolen it, was all I could reply. It has taken awhile to get Dragondoom back into print, and I thank my current publisher and editor for doing so. For those of you who are reading the tale for the very first time, I hope it becomes a favorite of yours; and for those who are reading it again, welcome once more to the story of Elyn and Thork. At times I've been asked, How long does it take to write a novel anyway? I could be flip and respond, Well, if you want to write it just anyway, then barely any time at all. On the other hand, if you want someone to read it . . . In general, I'm not that flip with people who are seriously trying to find out something about the writing process; and so instead I tell them the way I go about creating a story: the various stages of writing, from conception to final editing, speaking of the enormous amount of research needed, of the mulling time necessary to let the tale season, of creating living outlines and living synopses, of keeping note files, of making maps and drawings, and so forth. I haven't had anyone's eyes glaze over yet, but one of these days I expect someone to grab me by the shirt front, yank me up into their face, and yell, I didn't want no damn lecture, writer boy! So shut up and give me my answer! How long? Alright, already. No need to get hostile. Dragondoom took six years! Six years! In January 1982, Dragondoom began clamoring to be told. I was so busy at the time that I only managed to slap down a prologue (which subsequently became Chapters 1 and 6). In October 1985, at the World Fantasy Convention in Tucson, Patrick LoBrutto, friend and editor at Doubleday, asked me what I was working on. Dragondoom , I replied, Fate dripping from my voice. Hmmm. Good title! What's it about? Pat looked at me, perhaps a bit of hurt in his eye. C'mon, Dennis. You can tell me. After all, I am an editor, you know. The air conditioner of the car we rode in wheezed and labored — even in October . . . it was, after all, Tucson — as we rattled toward this Mexican-food restaurant (Tucson . . . Tucson). In February 1986, Pat sent a contract to me for Dragondoom , but I thought long and hard ere signing it. You see, until this moment, I had only written for the love of writing and not for the money. In May, after a call from Gerald Gladney, Pat's good right hand, I somewhat reluctantly put my X on the dotted line. The first 75,000 words were due in May 1987. In late June 1987, I began writing the story (until this point in time, all I had was just that prologue written back in 1982, plus many, many days and nights of thinking about the tale), and in September I shipped the first draft (about 80,000 words) to Pat to prove to him that the tale was about redbirds and bluebirds (swifts and swallows), that it was a love story. (Of course, those parts don't show up till the second 80,000 words of the story). So how long does it take to write a story? Perhaps a hundred days for this one . . . spread across six and a half years. So how long will it take me to write my next story? Without a doubt, about a hundred days . . . spread across . . . now lemme see, where'd I put that tarot deck? . . .
And, oh yeah, Dragondoom really is about swifts and swallows. It really is a love story. But it also has Dragons and Wizards and Giants and Dwarves and Humans and . . .